Our State bird may be the cardinal, our flower the peony, and can you believe we even have a state pie -- sugar cream? But let no one be mistaken: Our state garb is not a basketball jersey, nor is it the velour tracksuit. Many who call Indiana home are not beholden only to competition sports, and we do, in fact, possess fashion sense enough to sport other than fuzzy pull-ons when out and about, representing self and State. Indiana is so much more than its media-driven clichés, and while its plate overflows with essential issues that beg for proactivity, Indiana is a state with a considerable creative history, where the arts are alive and hanging in there. Brown County impressionism, polemic literary greats, songs written for the ages and a four-square LOVE with its skewed O are joined by a notable fashion legacy in Stephen Sprouse, Halston, Bill Blass and Norman Norell, who all have direct ties to this state. These fashion luminaries are part of an on-going creative quest one could argue is that much more profound, having been set against the social and statistical realities of a State where even the transporting of children to school is recurring fodder for polarized, political debate. Case in wonderful point were the 150 plus attendees at the third annual Hats Off lecture and luncheon, hosted by the Fashion Arts Society of the Indianapolis Museum of Art. Against the glass-walled, lush Springtime backdrop of the museum's 100-Acre Grounds, women and a small cadre of dapper gents celebrated this year's event, dubbed "Hats Off -- Hat Over Heels," to listen to guest speaker Elizabeth Semmelhack's "Heights of Fashion: A Short History of the High Heel," and learn (with our high heel love n loyalty the stiletto's reign goes on), and to sip n chat our way through a lunch and fundraiser that was as fun as it was fruitful. This was the year we quite literally kicked things up a notch, combining the derbyesque seasonal motif with the beloved shoe. I am now in my second year as president of the Fashion Arts Society, and can not think of a better way to combine work and fun founded on the love I have for fashion and the absolute conviction I feel to support artistic expression as an unequivocal right and vital means of expression. What we wear and how we wear it is one of the most functional, reflective and individualistic ways in which we say, "I am who I am," and is the tie that binds FAS members to each other, as beautifully diverse in our beliefs, careers and our personal styles as we are. Pushing envelopes and thinking just a tad outside the box is my personal mantra. I bet it is the same drive once felt by the erstwhile Hoosiers turned fashion gods we now honor, and it is no doubt what their stylin' descendants, our fashion students, fashionistas and FAS members, as resident heartland-ers, feel today: We cannot necessarily lay claim to our fashionability by virtue of location alone, so we speak out via the sums of our dreams and deeds. Sure, technology makes distance an intangible, but it's there nonetheless. Our looks, passions and adventuresomeness are therefore borne of a special conviction that merges the charm and casualness of our world with the edginess of the fashion universe at large -- and it's a great mix. 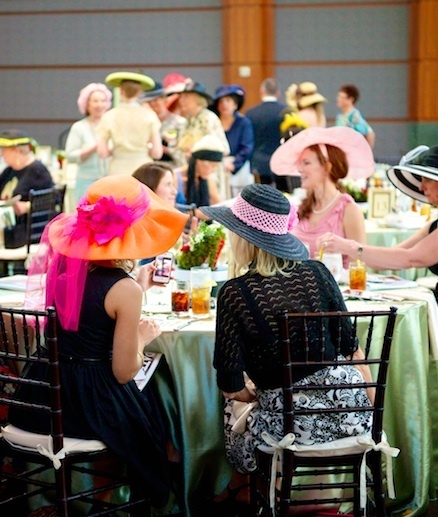 The collective voice of our 2014 Hats Off volunteers, sponsors and guests would be readily heard and approved of at any of Fashion's Meccas, and how nice that it all took place, as the song says, Back Home Again in Indiana.